The tarantula (Lycosa tarantula) is usually a variant of the wolf spider. · The tarantula (Lycosa tarantula) is usually a variant of the wolf spider. Some authorities are of the opinion that it is an ancestor of true spiders, and belongs to family Theraphosidae. · The commonest species involved in bites is Dugesiellahentzi (Fig 12.48). It is a large, hairy spider which causedpanic in Europe in the 17th century, due to a large series of bites beginning from the Italian city of Taranto and spreading to several European countries. Mass hysteria led to the development of a special dance (“tarantella”) which was supposed to protect the envenomed victim from serious effects. 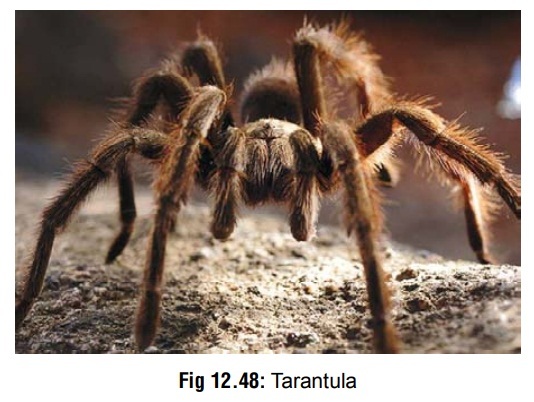 · The hairs of the tarantula may cause urticaria and conjunc-tivitis on contact. A number of species have urticaria-inducing hairs on the back of the abdomen. The tarantulas may flick these hairs toward an aggressor as a defensive mechanism. Contact may cause itching and wheals that persist for weeks. Ophthalmia nodosa has been reported after handling tarantula spiders. Allergic rhinitis may develop after inhalation of the hairs from pet tarantulas. · Bites can be almost painless, or produce a deep, throbbing pain for an hour or so. Local swelling may develop. · Treatment involves application of ice packs, wound cleansing, and antihistamines. Use of dapsone and ster-oids is controversial. Immobilisation of the affected part, elevation, systemic analgesics and supportive care usually suffice. Tetanus prophylaxis may be required.